If you are looking for a “canary in a coal mine” type of warning for the entire global economy, you have a whole bunch to pick from right now. “Dr. 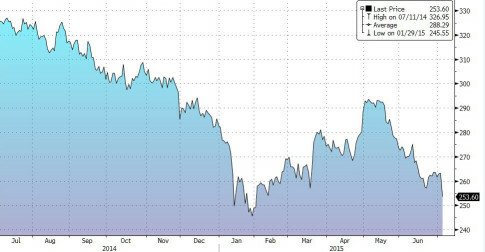 Copper” just hit a six year low, Morgan Stanley is warning that this could be the worst oil price crash in 45 years, the Chinese economy is suddenly stalling out, and world trade is falling at the fastest pace that we have seen since the last financial crisis. 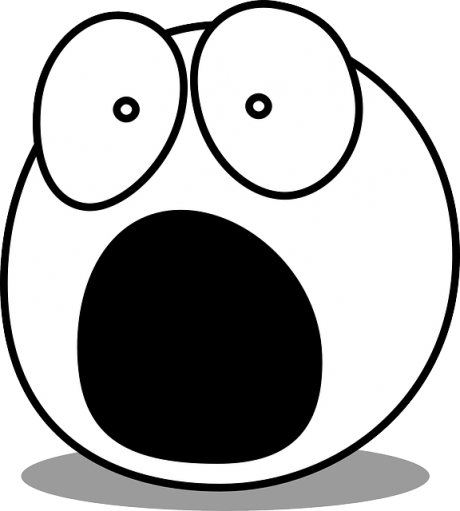 In order not to see all of the signs that are pointing toward a global economic slowdown, you would have to be willingly blind. In recent months, I have been writing article after article detailing how the exact same patterns that happened just before the stock market crash of 2008 are playing out once again. We are watching a slow-motion train wreck unfold right before our eyes, and things are only going to get worse from here. 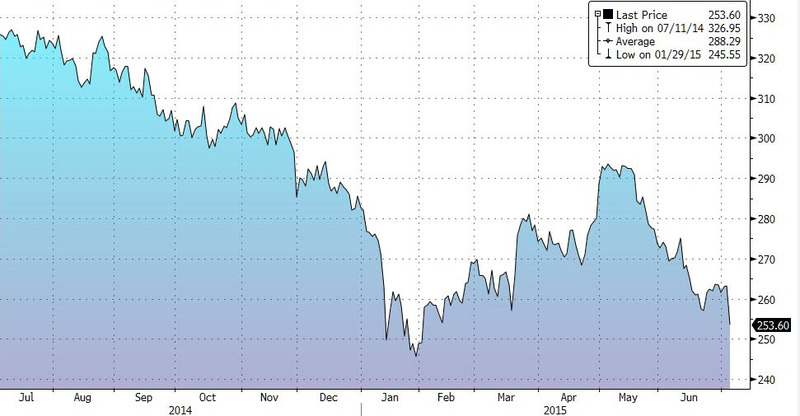 While the PBOC was literally everything in its power to keep the SHCOMP green (it was too late to save the Shenzhen, the Chinext or most Chinese stocks as the PBOC’s firepower was limited to just the largest companies), it forgot about that other proxy of overall Chinese health: copper which, as the chart below shows, plunged by 4% to the lowest price since February when the oil commodity crash left everyone speechless and was threatening to destroy the entire junk bond space. But while in this centrally-planned world, in which nobody even denies anymore that all markets have become central banker playthings, fundamentals are irrelevant and few have a clue what this latest crash in copper may signify (some do, and it isn’t pretty) an even more disturbing clue for the fate of this erstwhile “market doctor” is revealed when looking at the long-term price chart. Here, as SocGen notes, copper is in danger of breaching a huge 15 year support line… after which it is free fall for a long, long time. Copper is probing again the 15-year trend line support (5550 levels). Perhaps the world is beginning to realize that “it’s the demand, stupid” as crude oil prices are collapsing this morning (not helped by “all out production” news from Oman). While ‘markets’ rallied peculiarly after last week’s epic surge in inventories and production data, that has all been given back as one trader noted “the market got ahead of itself, even though the rig count has been falling it is not until mid-yr that we are going to see some impact on supply.” WTI is back under $49. To complete the gloom, Copper is probing lower, breaking key support with projections to 222.50 if this move takes shape. While we have warned about the problem with near-infinitely rehypothecated physical/funding commodities/metals, be they gold or copper, many times in the past, and most recently here, it was only yesterday that China finally admitted it has a major problem involving not just the commodities participating in funding deals – in this case copper and aluminum – but specifically their infinite rehypothecation, which usually results in the actual underlying metal mysteriously “disappearing”, as in it never was there to begin with. Copper prices are tumbling already (despite Gartman’s most recent prognostication on Dr. Copper’s China recovery meme) as the world’s 7th largest port disallows any shipments until the probe is complete. 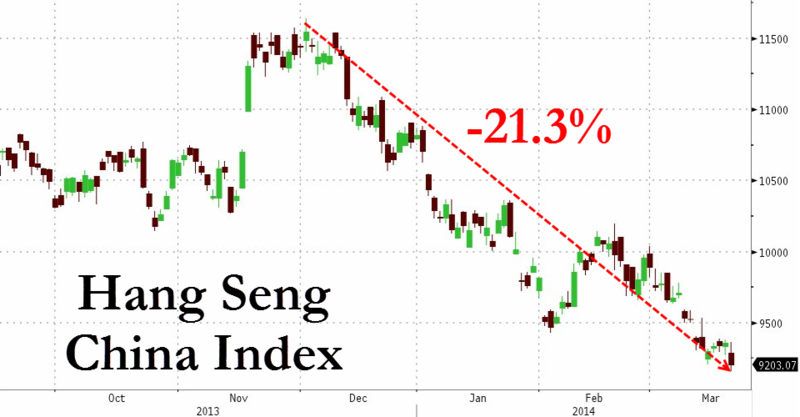 Following the default of 2 more corporations last night, Hang Seng’s index of China Enterprises plunged to 8-month lows and officially entered bear market territory. Overnight angst in the Chinese currency markets (which saw the Yuan trade back to 1-year lows) has sparked broad commodity weakness (as CCFD unwinds en masse) with copper giving back most of yesterday’s major short squeeze gains back. Chinese corporate bond prices also tumbled to one-month lows. Is ‘Dr. Copper’ Foreshadowing A Stock Market Crash Just Like It Did In 2008? Is the price of copper trying to tell us something? Traditionally, “Dr. Copper” has been a very accurate indicator of where the global economy is heading next. For example, back in 2008 the price of copper dropped from nearly $4.00 to under $1.50 in just a matter of months. And now it appears that another big decline in the price of copper is starting to happen. So far this year, the price of copper has dropped from a high of $3.40 back in January to a price of $2.95 as I write this article, and many analysts are warning that this is just the beginning. By itself, this should be quite alarming to investors, but as you will see below there are a whole host of other signs that a stock market crash may be rapidly approaching. Read moreIs ‘Dr. 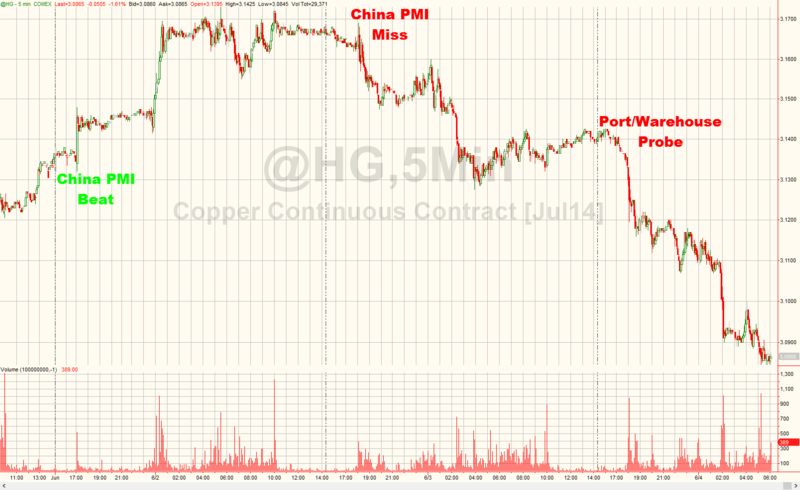 Copper’ Foreshadowing A Stock Market Crash Just Like It Did In 2008?